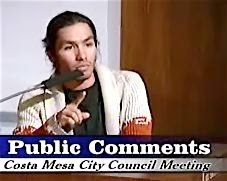 Tomorrow, Tuesday, September 25, 2007, at the Harbor Justice Center in Newport Beach, the trial of Benito Acosta - a self-professed native American who also uses the name Coyotl Tezcatlipoca - will finally stand trial on the charges filed against him following his expulsion from the Costa Mesa City Council meeting on January 3, 2006. You may recall that Acosta was one of dozens of speakers before the council that night addressing both sides of the plan by Mayor Mansoor to cross-designate every Costa Mesa police officer as an immigration screener. When Acosta encouraged his supporters in the audience to stand and show their support Mansoor cut him off even though he still had 30 seconds left on his three minute allotment of time. Acosta was subsequently dragged from the council chambers by several Costa Mesa police officers and arrested. I'm not sure how this is going to play out, but it certainly did appear that our young jailer/mayor applied a double standard that evening. For example, his sponsor as an honorary member of the Minuteman Project, founder Jim Gilchrist, spoke earlier and did exactly the same thing - he requested his "5 or 6 dozen supporters" to stand and be recognized. (The adjacent photograph shows Gilchrist motioning to his supporters in the audience) Mansoor did not demand that his supporters cease and desist. Quite the contrary, he encouraged Gilchrist to have them stand. And, Gilchrist was permitted to speak 20 seconds beyond his allotted time. I've watched the city tape of this event several times. I've also watched video from other sources, which showed the breakdown of order following Acosta's forcible removal from the council chambers, with members on both sides of the issue singing at the top of their lungs. It was not a pretty sight, although some of Mansoor's "improver" buddies can be heard chuckling in the background of one tape. It certainly appeared that Acosta was complying with the directions of the officers as he left the podium before then-Chief of Police John Hensley directed the officers to remove him. I don't know the law on this issue. I do know that I expect our leaders to apply the rules evenly - that didn't happen on the evening of January 3, 2006. I fear this will further inflate the sails of the anti-illegal immigrant vehicles. Isn't there another stategy we could use to defeat the majority? As far as I know, this whole "Coyotl" thing is not part of any "strategy" to oust the current majority. This is just one very high profile example of our mayor's ineptitude. It's as though he just goes through life looking for piles of dung in which to step. While I agree that the apparent stifling of Mr. Acosta's speech appears troubling on its face, there is more to this story. Mr. Acosta, using the same podium as his soapbox, called the elected mayor of Costa Mesa a "f@@king racist pig" and called for disruption. There is a huge difference between petitioning an elected body and yelling obscenities and threatening to dispupt the proceedings of that body. 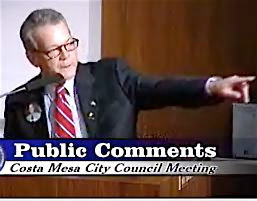 Mr. Acosta also publicly stated that he was meeting with members of the illegal immigrant community to educate them on the "real" intentions of the CMPD, despite repeated assurances from Chief Hensley that no sweeps or other targeted action would be taken against illegal immigrants living in Costa Mesa. Mr. Acosta was deliberately and callously inciting racist fear in the community and doing real harm to relationships that had been carefully built between the police and the Latino community. Personally, I hope that he is convicted and serves time, even if it is a day in jail. This young man needs to learn that there are consequences for his actions. True, Acosta started off the meeting question much calmer than his previous antics. While I cannot know what was in the mayor's head when Acosta started to call for the audience to stand, one could assume that he was trying to head off any further antics by an "activist" who had demonstrated complete and total disregard for decorum, the City, its leaders, its citizens, and the rule of law. To me, that is reasonable. Granted, I have nothing but animus for Acosta, so my opinion is a bit biased! Acosta is annoying and I am not in any way going to support his agenda or message. None the less, City Council meetings are a public forum and everyone deserves the courtesy of their full 3 minutes as long as they don't incite a riot. Foul language, name calling, etc. will get your message dismissed in my mind, but free speech is free speech. A huge number of our citizens have died over the last couple of hundred years to insure that he has the right to speak freely. I may hate his message but I will defend his right to deliver it to the public. I am sure the Mayor was annoyed with him and that played a part in his actions. Interestingly enough, the Chief of Police felt he was justified enough to support the Mayor's actions. I guess we will see what the courts think now. According to the brief piece in the Daily Pilot today, jury selection was accomplished yesterday and the trial will begin today. In fact, at this moment they are well into it. The ruckus that caused this whole thing began after Mansoor shut him off early, when he was being escorted fairly calmly by the police officers. The audience began to agitate, which was when Chief Hensley told his men to remove Acosta. The following chaos seemed to be equal parts Acosta supporters and, for lack of a better term, anti-Acosta activists. The singing of "We Shall Overcome" by one Acosta supporter provoked the screaming - what I heard certainly was not singing - of "God Bless America" by those on the opposite side of the issue. The video is incendiary, but did record the moment. I think the mayor was wrong to cut him off and for attempting to prohibit his supporters to stand as Gilchrist's had a few minutes earlier. I guess we'll find out where that "free speech" line is drawn in Costa Mesa when the jury renders it's verdict. I am a veteran and I agree wholeheartedly with your point about free speech. The distinction here is the forum. You are not allowed to speak completely freely at a City Council meeting. If he had been on the sidewalk or front steps - I would be supporting his right to speak regardless of his message, and I am dead serious about that. Geoff, I absolutely agree that the mayor should have let Acosta's crowd stand if he allowed Gilchrist's crowd to stand. I believe, as stated previously, that the behavior at the prvious meeting caused not only an increased police presence, but anticipation of violence or disruption by Acosta's crowd. I think that was a reasonable assumption. I think the court proceedings will provide needed clarity as to what is legal and appropriate. One thing to note - Acosta kept demanding that the officers not touch him. Unfortunately, in that situation, he has no options but to comply. That becomes resisting an officer. That is another debate - at what point is it appropriate for a law enforcement officer to go hands-on with a citizen. In this situation, they were charged with removing him, and he chose to resist. I know damn well that if I struggle with a police officer, I will lose that fight and get arrested. I agree that you are not allowed to yell "fire" in the council chambers. I even understand that obscenities are outlawed in the municipal code. I suspect under judicial review, any political or policy related rant regardless of invectives would probably be allowed as free speech. The thing I find obvious about this incident is that the Mayor jumped the gun. If he was REALLY concerned about a riot he should have given it a bit more time to develop before sending in the sergeant at arms. My opinion of course. By the way, although I am not a veteran, My wife and I come from families with a large number of veterans from WWII, Korea and Vietnam and have a huge amount of respect and gratitude for their service and sacrifices. Yours included! Thank you - I don't mean to flaunt my status as a vet, just to emphasize that I swore an oath to defend the Constitution and I take it very seriously. I was initially upset about his forced removal, but his actions, both before and after the incident, led me to side with CMPD and the mayor.